I live in the centre of Paris so you might think that my weekend was full of danger, fire and fear. That is what my friends and family living far away saw on TV and Facebook, so I had a few worried calls and messages. But let me tell you the truth: it was no war scene. A “yellow vest” demonstration on the Champs-Élysées definitely turned into chaos and it frightened people. The demonstration was smaller than the previous ones, but a lot of people turned violent. 120 cars were burnt, a lot of urban facilities destroyed and 133 people wounded, with tons of grenades and water cannons used by the police. On Monday morning, 340 people were still in custody. Most of them are young males between 30 and 40 coming from the province, or younger boys from the Greater Paris area. It does not look good for Macron, or France. But the media coverage was exaggerated. Headlines like “Paris is burning” or “war scenes” or “battlefield” in Paris kept spreading on social networks with video of fires in the night in front of the Arc de Triomphe. On TV, a few anchormen wore metal casks on their heads, in an attempt to convince their audiences they were reporting from the “frontlines”. They were from Russia Today. They interviewed people talking nonsense, who said they had seen the police setting fire to the cars themselves. But the fake news factories fueled by Russia are not the only ones to throw gasoline onto the fire. Paris is so clickbait-esque that all the international print or broadcast media insisted heavily on showing “riots” and “unrest”. 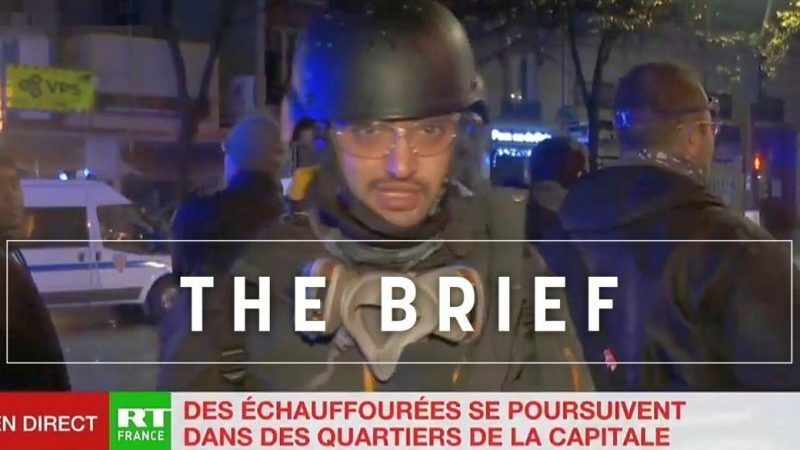 The WSJ underlined “havoc” in Paris, the NYT “turmoil”, with a spectacular video of the violence. The violence is real. The anger from part of the working class is also real. But as a spontaneous move, born on Facebook and without leader, the “yellow vest” is also a fake news paradise. Nobody from yellow vests can confirm or deny anything. A video arguing that France has lost its constitution because of an unclear decree has been widely shared by yellow vest supporters. Images from people wounded in Barcelona, Spain, have been shown purporting that it was happening in France; Belgium’s army, whose forces wear yellow vests when travelling, has also been used to spread fake pictures. In the middle of all this fake news, it appears that real pictures can also be twisted. Adding a sensational title is so easy when you have a burning car in the frame with a Paris backstage. But Paris is not burning, Paris is not a war scene, there are no bullets and no arms. In fact, most of the “yellow vest” demonstrations in France have been quiet and peaceful and located in remote places. It is a deep and complicated move, not a clickbait story with a shocking picture. As storm clouds loomed on the horizon in Buenos Aires, a trade ceasefire agreed between the US and Chinese presidents upheld the watered down G20 communiqué. French President Emmanuel Macron warned during the meeting that he will oppose a trade deal between the EU and Mercosur if Brazil’s incoming far-right president pulls his country out of the Paris Agreement. On planet Brexit, Labour threatens PM Theresa May with a new Brexit hurdle ahead of the parliament vote on 11 December. UK’s Brexit secretary seems still to be a bit confused about proceedings. People of African descent face systemic racism in the EU, according to a report by the European Union Agency for Fundamental Rights. European institutions are struggling to lead by example. No “quick fix” in sight: A group of EU states rejected the compromise on an EU-wide tax on digital revenues of large companies as the deadline looms. On another tax front, Germany and France announced a joint proposal for an EU financial transaction tax that is based on a model already tested in France. The Czech Republic’s billionaire PM faces more legal trouble over misuse of EU funds. The ongoing investigation his possible conflict of interest damages the country and harms the EU as well. Messages obtained from the WhatsApp account of murdered journalist Jamal Khashoggi shine a light on the possible reasons behind his death. 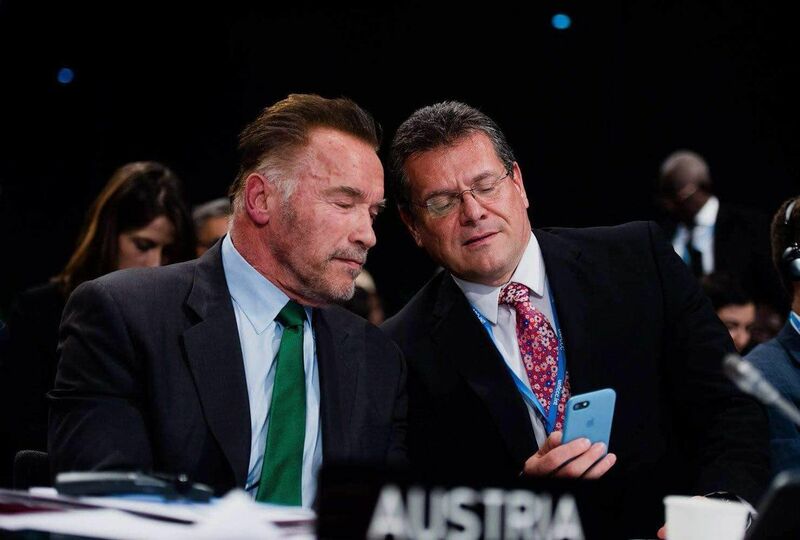 COP24 kicked off in Poland today and two of the (literally) biggest men in politics met up: but what were Arnold Schwarzenegger and Maroš Šefčovič up to here? Tweet us your best captions here for a chance of a shout-out in The Brief! The ECJ will issue an eagerly-awaited opinion on whether the Brexit-triggering Article 50 letter can be unilaterally revoked by the UK before the end of March. It won’t be a legally binding decision but could prove definitive over the coming months. The Commission and Council both say that it would require a joint decision to revoke.